Dan “Chimy” (shim-ee) Chmielinski began his love affair with the bass at the young age of 3 and never looked back. 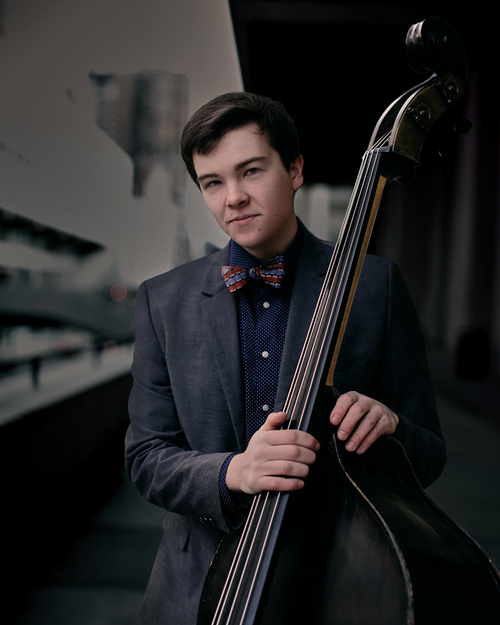 Now 21, Dan is an accomplished bassist who has traveled the world performing with Etienne Charles, Bryan Carter, the Joey Alexander Trio, Sammy Miller and the Congregation, The Kyle Athayde Dance Party and the New York Jazz Symposium. He is currently in his fourth year of the jazz studies program at The Juilliard School, led by world-renowned trumpet player and jazz educator Wynton Marsalis. Dan has been continuously inspired and mentored by some of the world’s greatest jazz musicians and classical bassists including Richard Davis, Ben Wolfe, Jay Anderson, and currently studying under the great Ron Carter. Prior to attending The Juilliard School, Dan attended Glenbrook South High School, participating in their Grammy Award Winning arts program. Dan also performed with the Midwest Young Artists Big Band (2009-2012) and Symphony Orchestra (2008-2012), the Fatum Brothers Jazz Orchestra (2008-2010), and with various other ensembles in New York and Chicago. In the summer of 2012, Dan was one of 15 musicians selected to participate in Ravinia’s prestigious Steans Institute, where he collaborated with jazz masters David Baker, Nathan Davis, Curtis Fuller, and Rufus Reid. In 2014, he was selected to receive Juilliard’s Ron Carter Scholarship. Dan is also well-studied in composition, specifically film scoring, and has studied with composers Philip Lasser and Kendall Briggs. He recently scored NYU filmmaker Connor Smith’s first feature-length film, “Smoke in the Air.” In addition, Dan teaches privately and educates through Jazz at Lincoln Center’s Jazz For Young People Program, Juilliard’s Educational Outreach Program and Juilliard’s jazz summer programs.